EAHAE International Member: Leadership with Horses, Paul and Sarah Jackson. What would it mean to you and the teams (family or organisational) you work with to make lasting improvements to communication, negotiation, coordination, responsibility, integrity, humility and emotional congruence? And to have a strong sense of direction and purpose? Paul and Sarah Jackson run their Leadership with Horses programmes from their organic family farm in the Slad Valley. 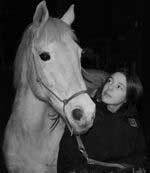 The amazing sensitivity and powerful feedback of horses generates awareness. This experiential learning creates a space where potential can become performance, often the learning is both dramatic and sustained. Working with horses enables us to distinguish who we are and what is fundamentally important to us - with unforeseen clarity and powerful intention.